Sept. 22, 2010, 12:30 p.m.
By Joshua Benton @jbenton Sept. 22, 2010, 12:30 p.m. The web redesign looks an awful lot like an iPad app: stories set into big touchable-looking blocks; non-standard web typography; more white space and more room for graphics than 99 percent of newspaper websites offer. And below the area in the screenshot above, the selector for moving between different Times columnists is all done in Ajax, so each click seamlessly shifts between content, much as a nice menuing system in an app might. Even the ING Direct ad in the upper right looks like the sort of small display ads some apps use. In some ways, this redesign more closely resembles the original NYT iPad app previewed in January than does the app the Times eventually shipped. 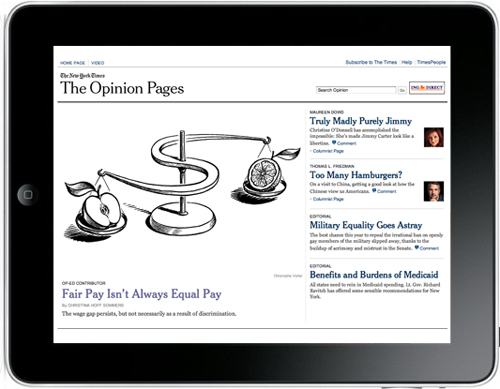 The redesign is limited to the Opinion front door; the actual story pages are unchanged. But this is the strongest sign yet that the design motifs news organizations are using in app development are bleeding back into the web, as I’d predicted back in April. Twitter’s recent redesign, of course, had a similar app-to-web feel. I’d just like to put a signpost in the ground for the argument that the needs of the Internet are not “bottomless needs.” There is not a single human being who consumes everything The New York Times produces online in a given day — or even the amount that The Dallas Morning News, or The Toledo Blade, or The Podunk Gazette produce. (Okay, maybe The Podunk Gazette.) Aren’t there any number of successful online content businesses built around strong but not overwhelming-in-quantity content? I have no data to prove this, but I think there’s a chart to be drawn somewhere that features both quantity of content output and loyalty of audience, and I don’t think they line up 1:1. I don’t think the hamster-wheel model makes a lot of business sense for even a lot of online news outlets, whatever journalism sense it may make. The hamster-wheel urge to produce more more more is happening at the same time that audiences are feeling more overwhelmed than ever with information. There aren’t many Americans who, at day’s end, lament: “Man, I just wish I’d had access to more content today.” There’s a role to be filled by providing simplicity, a more limited universe of choices, and information underload. I’ve called it before a New Urbanism for news, and I think designs like this are a step in that direction. POSTED Sept. 22, 2010, 12:30 p.m.
Benton, Joshua. 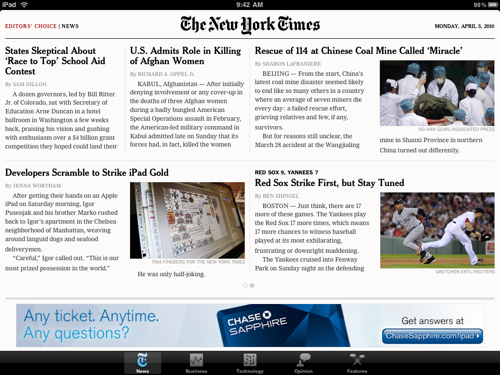 "NYT’s Opinion Pages continue the march toward app-inspired design." Nieman Journalism Lab. Nieman Foundation for Journalism at Harvard, 22 Sep. 2010. Web. 19 Apr. 2019. Benton, Joshua. 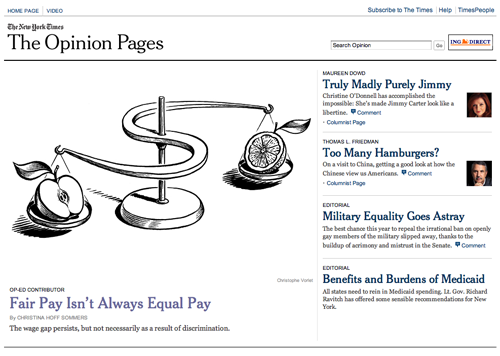 "NYT’s Opinion Pages continue the march toward app-inspired design." Nieman Journalism Lab. Last modified September 22, 2010. Accessed April 19, 2019. https://www.niemanlab.org/2010/09/nyts-opinion-pages-continue-the-march-toward-app-inspired-design/.